Many people on a paleo, grain-free, or low carb diet find themselves eating eggs almost everyday for breakfast. It can get very boring. These gluten-free pancakes are a nice change. They are grain-free, low-glycemic, and low in carbs. 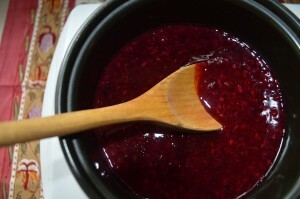 The berry sauce is very high in anti-oxidants and low in sugar. 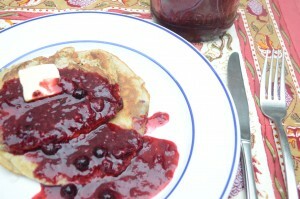 This gluten-free pancake recipe with high-antioxidant, low sugar berry syrup make a wonderful breakfast. They are also perfect for a lazy Sunday brunch. Prepare the berry sauce (recipe below) and set aside. Place all of the pancake ingredients, except the butter, in a bowl and whisk them together. Melt the butter in a pan on the stove on medium heat. Pour in pancake batter, cook until browned, and then flip over. Serve with grass fed butter and berry sauce. Place the water in a pan on the stove and bring to a boil. Add the Xylitol and Stevia and stir until they are dissolved. Add the strawberries, raspberries and blueberries, reduce the heat, cover and bring to a simmer for 10 minutes. Mix the arrowroot with water and slowly add it to the pan and stir continuously. Bring back to a boil until it thickens. Serve the gluten-free pancakes with butter and berry syrup. Click here for more gluten-free recipes.